Though digital consumption habits in Switzerland are high, ad spending patterns have not followed suit, according to new research. Switzerland is one of the most advanced markets for internet and mobile usage in Western Europe, according to eMarketer’s latest forecast. 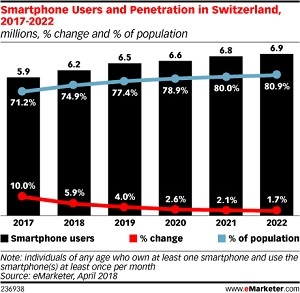 In 2018, 86% of the population in Switzerland will use the internet, and nearly 75% will use a smartphone at least once per month. But while digital usage has surged, digital ad spending in Switzerland has lagged behind most of Western Europe. eMarketer estimates that digital ads will account for just over a fifth of media budgets this year. By comparison, in Sweden—which has similar usage rates—digital will make up nearly half (45%) of all media budgets. Traditional media, including print and TV, still draw large audiences in Switzerland and this is where advertisers are focusing spend. Concerns about digital privacy, especially on social platforms, are widespread and a result, advertisers are approaching social media advertising with caution. This has led to low digital ad spending overall. However, as consumers become more trusting of digital, spend is expected to follow. Indeed, growth has already started: This year, digital spend in Switzerland will increase more than 7% to $1.09 billion.